Yes Virginia, there really is a Santa Clause...and he's coming to eat your brain. Yep, that's my yard zombie. We decided to leave him up for the holidays since he got into the spirit. But on a serious note, happy holidays to all! Your Yard Zombie makes me think of `A Christmas Carol,' and Marley's ghost. Dickens was totally in favor of a spooky holiday. :) Hope you have a great Christmas. LOL, your yard zombie is hella creepy! Chicory, you might have just named my zombie. He's been needing a name, and now I'm torn between Marley and Dickens. I think he's going to get a New Year's hat, too. If I can keep him cute, my hubby might let me keep him in the front yard. 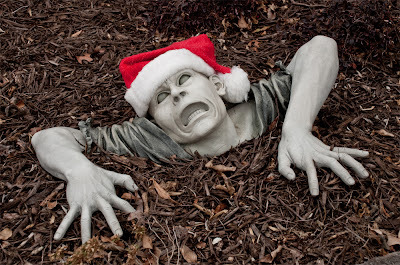 Haha, love the Santa Zombie. Hope you had a great christmas, and will have a great New Years!